Starting in DotNetNuke 6.0 support was added for log4net, a first rate logging framework developed by the Apache Foundation. So why log? Well any non trivial module can benefit from logging, it means you can easily debug an issue on a live site and see what is happening under the hood. A liberal sprinkling of logging statements in your DotNetNuke module can save you a lot of time when you have some unexpected behaviour in your module. DNN have wrapped the standard log4net logging statements in a class called DnnLog which is part of the assembly DotNetNuke.Instrumentation.dll. So to get started with logging you need to add a reference to this dll in your code. So if we have the logger set to record all debug level messages it will also log the higher log levels as well, if we however set the log to error level then only error and fatal would be record with the other lower levels ignored. Within the DNN class DnnLog we have a method for each type of these logging events with various overloaded options. So using this logging statement we can use string formatting to record the debug log message. We can also log exception using a different overloaded method. Using intellisense it is pretty easy to discovery the correct method to use. So that is all there is to it, oh wait, where do the log messages appear and how do we control the level? Within the root of the DNN site you will find the file DotNetNuke.log4net.config this is used to control the logging within the site. The default setting is to log to a file only error levels or above. 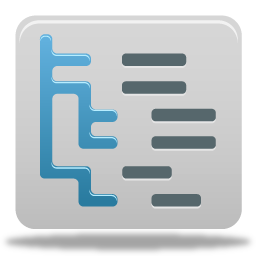 A new log will be created each day, its important to remember that DNN won’t delete old log files so this could grow to be a large directory if left unchecked. Something which can be useful when debugging and developing is to have the DNN log statements output in the standard ASP.net Trace Output for the page. Its a pretty simple thing to do, you would just need to add a new appender that uses the AspNetTraceAppender and then define the appender in the root element. I hope you found this article useful and you give the DNN logging framework a try in your next module. Cart Viper allows you to customise the captions used throughout the module, this allows you to change the captions to better suit your requirements for example or client. 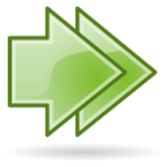 All the captions are stored in a resource files (.resx) within the module folder, however we do not recommend that you edit these files since any future upgrade of Cart Viper will replace your modified files ones from the new package. 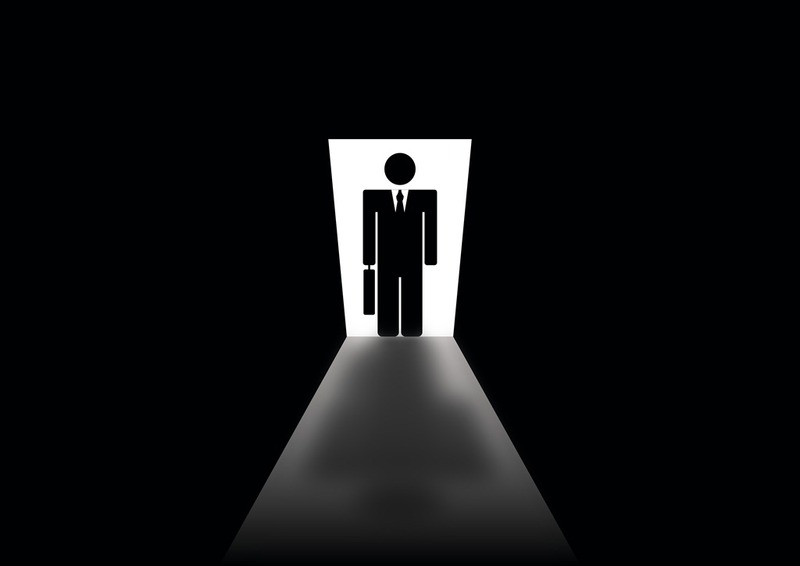 Instead you should use a portal specific resource file which will not get over written with future upgrade and also means the change won’t affect other portals. 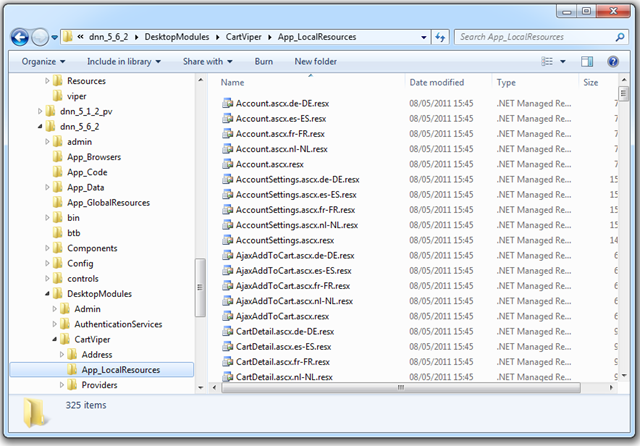 DotNetNuke first looks for a resource key it needs in a portal specific resource file before falling back to general resource file if unable to locate the key. Since we have this fall back feature our portal specific resource file only needs to contain the resource caption we want to change, the standard resource file will supply the other captions. Lets take a look at an example, I’m going to change the caption on the mini cart module to use the world “Basket” in place of “Cart”. The first thing we need to do is locate the correct resource file. Each ASP.net ascx control has 4 resource files, each for the 4 different languages we support. For the demo here I’m just going to change the English version however the same principle can be applied to any of the other languages. Additionally we have a SharedResources.resx file which contains captions used by the AJAX code to return the correct messages to display. 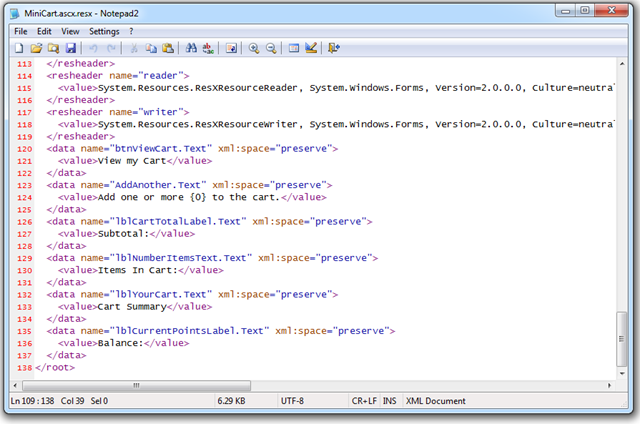 Lets go a head and open that file with notepad or similar, the file itself is just a XML document that has key value pairs for the captions. Most of the file contains comments and boiler plate entries, the place we need to look at are the elements with the <data> element. The name attribute of the entry will be the name of ASP.net control that is rendering the caption. I've created a blank resource file which you can use as the basis for the new file. Into this file we are going to copy the entries we want to change. I’m going to copy the following entries into my new file. 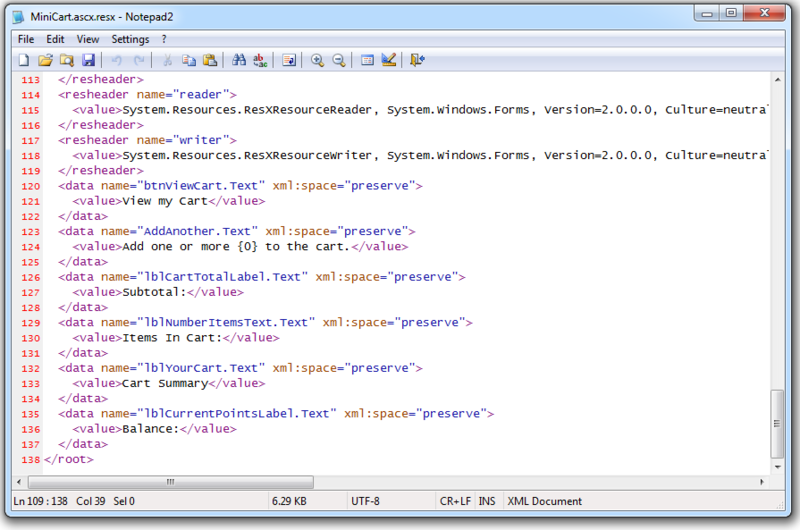 After copying these into the template file I’m going to change the word “cart” to “basket” in the value elements. The most important part of implementing the change is to name the file correctly, the file needs to be named with the original file name but needs .Portal-X (where X is the ID of the portal you are wanting to apply the change for) inserted just before the .resx extension ending. Refreshing the page shows the new resource file has been picked up by DotNetNuke. My complete resource file is listed below for reference. 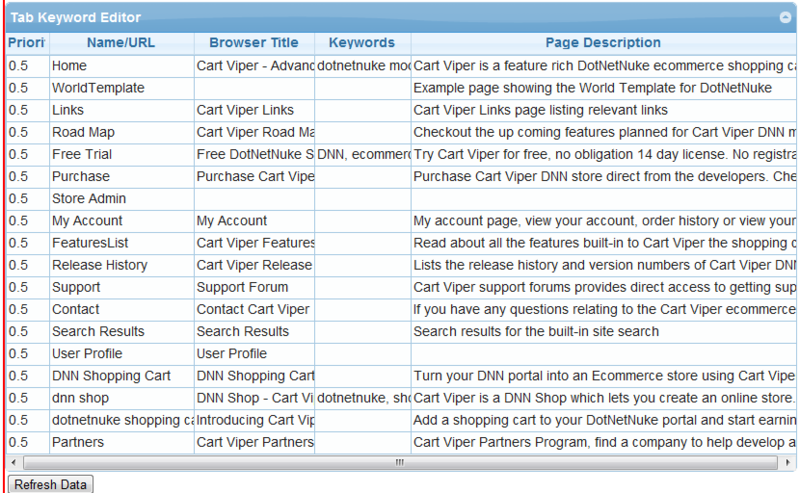 Yesterday we released the next version of Cart Viper 1.2.6. This new release contains lots of new and improved features along with bug fixes to minor issues. Create and manage an unlimited number of tabs for a product. Google Checkout is supported as a payment gateway. Carousel template for use with the Related Products, Recently View Products and Product widget module. The Category menu can now optionally expand and collapse the items in the menu. 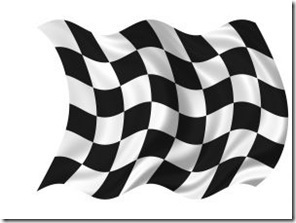 Order PDF supports adding the Model Number or SKU field to each line item ordered. 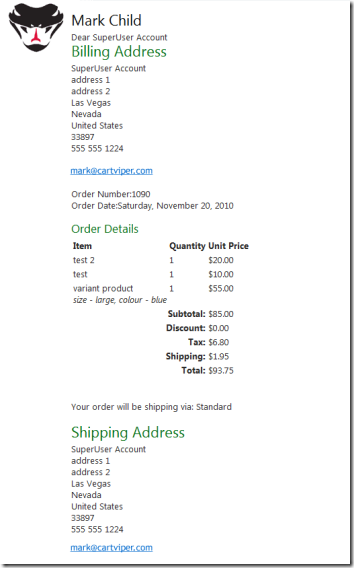 Payment method displayed on the confirmation emails, order and PDF generated by Cart Viper. Ability to display a MSRP which is struck out in the store front. Out of Stock flag on a product. Wish lists now support product variants. Ability to make a wish list public and share the link with friend. Ability to operate a store without an online payment gateway just using the offline payment option. Ability to display prices inc VAT in the cart and mini cart. Products support serial numbers with automatic assignment of the next free serial number. Optionally collect Company Name and/or VAT number at the checkout stage. With that release out of the door we are now turning out attention to the next release, if you’ve got a suggest or idea you would like to see added please let us know. 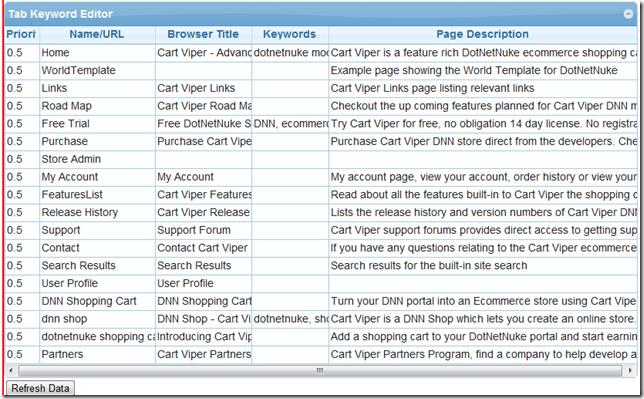 Why pick Cart Viper as your ecommerce platform for DotNetNuke? 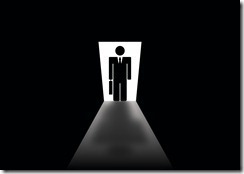 DotNetNuke gives your clients a great web application allowing them manage their website’s content with easy. Now imagine using DotNetNuke to offer a complete ecommerce store for the client, complete with online checkout, order history, template driven design and so much more besides. Having a single web application for both CMS and ecommerce makes management easy for client, it also makes creating the solution simple for you since you’re experienced with DotNetNuke already. 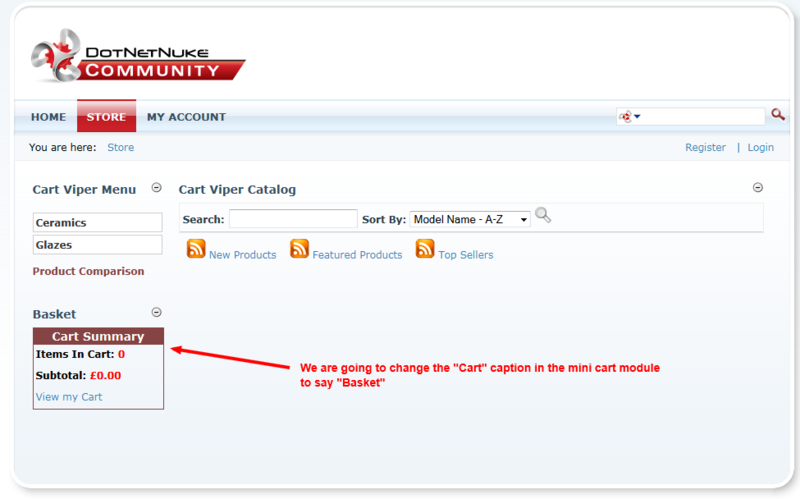 Since we first had the idea to create Cart Viper we have worked hard to make a great product that is easy to use and contains all the features you need. Over the last 9 months we’ve been adding and improving the features of Cart Viper, most of these have come direct from you our customers providing feedback. We are committed to making the best ecommerce module on the DotNetNuke platform. Don’t take our word for it, look at the review, testimonials and take the free 14 day trial. Recently Robb Bryn over at DotNetNuke fool took the time to review several eCommerce modules for DotNetNuke, we are pleased to say his review put Cart Viper top overall with an average score of 3.6 from a possible 5. We are obviously very pleased about this as we have only be developing Cart Viper for 6 months, and were in a strong line-up that included all our more established competitors. We have taken Robb’s comments onboard and are looking to address a number of his concerns with our forthcoming 1.2.4 release with a view to making an even better product! Cart Viper is available for a free 14 day trial here. 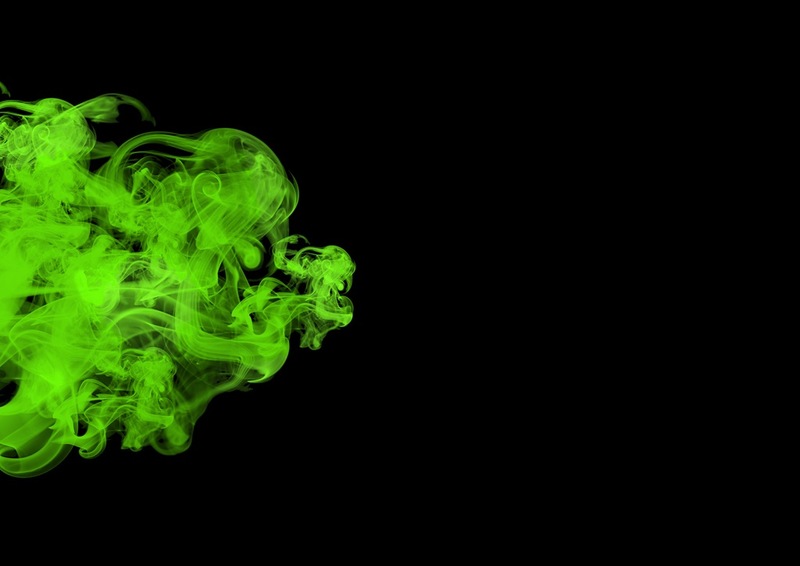 Here at Cart Viper we are happy to announce we have released version 1.2.3 of Cart Viper and it is now available to download and take a free 14 day trial. Remove all unmanaged code so Cart Viper is now fully compatible for running in a medium trust environment. Google analytics ecommerce and event tracking supported. If a product is a digital download you can specify an unlimited number of files to be downloaded by the user once order has been placed. Ability to import SEO keywords for a product during the product import routine. Add ability to disable product comparison feature via admin settings. Bug fix when viewing an order as an anonymous customer. 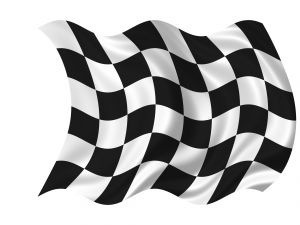 Following on from our New Years resolution to release smaller updates more frequently of Cart Viper our DotNetNuke Ecommerce module, Mark and myself are happy to announce version 1.2.2 is now available to download for a free 14 day trial! Enhanced existing “My Account” module so a customer can now search for their orders by order ID or order status. Optionally limit the quantity of a product a single user can purchase per order. Mark a product as “free shipping” so regardless of the shipping rules for the store this product will not incur a shipping cost. Product wishlist enhancement – a user can now create an unlimited amount of product wishlists. Product comparison – allow a user to compare up to 4 products side by side to view the differences. Product import via CSV enhancement – if the product already exists in the store the product is updated rather than re-added during an import. Product SKU – store admin can now optionally store a product SKU. 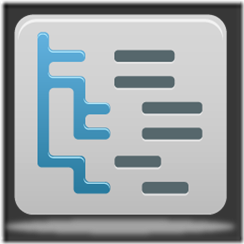 Product barcode – store admin can now optionally store a product barcode. Product widget enhancement – can now select products that are currently on special offer to display in the product widget. Product category edit bug fix. If you have any feedback good or bad or would like to request a feature please let us know. 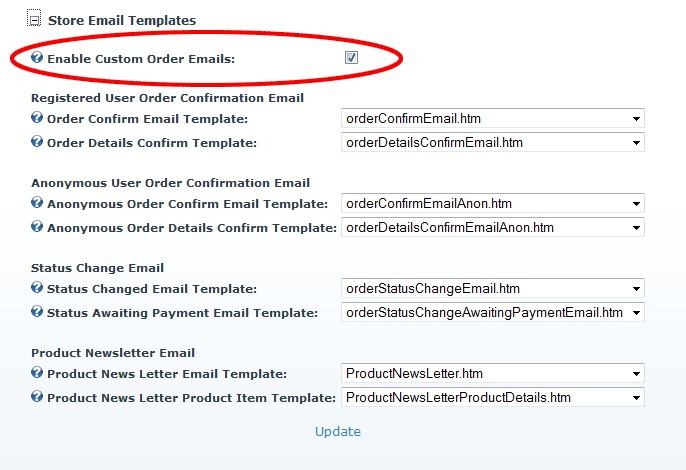 One of the improvements we’ve made to Cart Viper 1.2 our advanced ecommerce application for DotNetNuke is the support for using templates to generate the emails which are sent to the customer once they place an order. In the previous version the email was limited to being a plain text email which is stored in the resource files, this still exists and you can continue to use this but we’ve adding in advancing template functionality which allows you to create rich HTML emails. 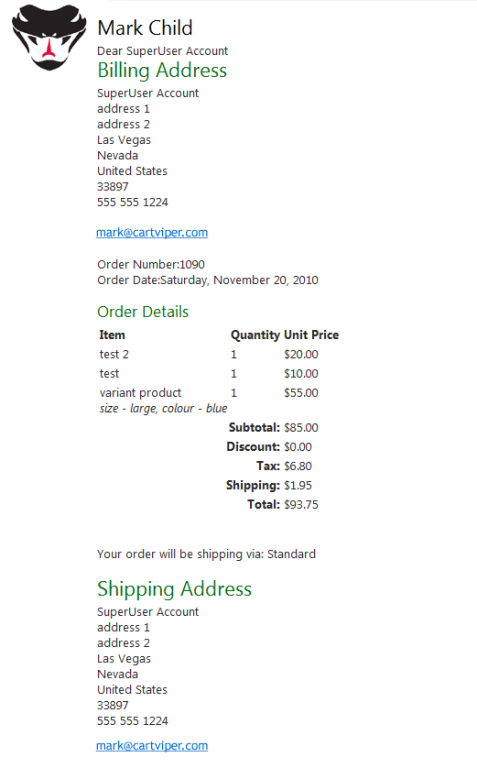 So for example you can now add your store logo and branding to the order confirmation email. This will then use the templates listed in the drop down lists to create the email message used to communicate with the your customers. The template files are just html file which contain normal HTML mark-up and also tokens which are substituted with data from Cart Viper at the time of the email generation. So for example we have a token which allows us to output the customer’s name into the email. 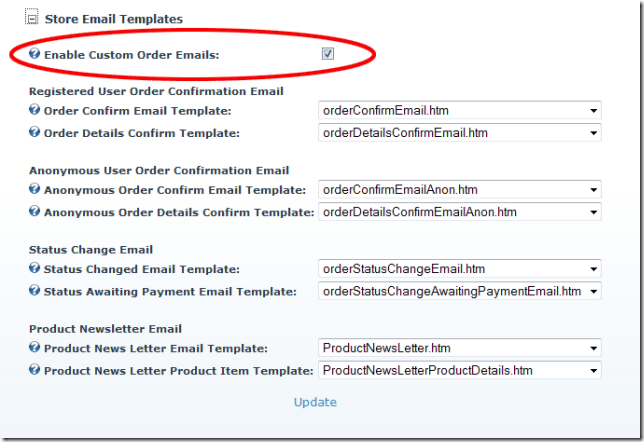 When using Cart Viper in multiple portals with a single host each store can have their own customised email templates as well. The manual provides a full break down of the tokens we support in the templates and how to go about customising them for your requirements. Don’t forget we offer a full 14 days free trial, no registration required, all backed up by our first class support.